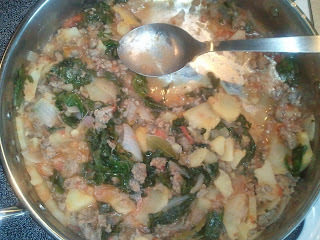 Tonight I made a skillet dish/soup using some of the sausage we got in our CSA and some veggies. I thought the sausage might be like a Mexican chorizo since it was labeled as "Ground Pork Sausage...Hot" but it wasn't anything like Mexican chorizo. It tasted good though, and I'm glad I tried this dish, considering I'm not a very big fan of sausage and I did not have high hopes for how it would taste while I was cooking it. Cayne loved it and calls it perfect "man food". I will admit that the sausage gave a good flavor and the kale was awesome-tasting in this dish. Brown the sausage in a large skillet (like you would brown ground beef). Add the onion, potatoes, and garlic and sautee until onions are tender. I also added a little vegetable oil because there was not much fat in our CSA sausage. Add the chicken stock, bay leaves, and con of tomatoes. Once the liquid is hot and bubbly, add the kale (you might have to add in batches, so that it will wilt, making room for more in the pan). 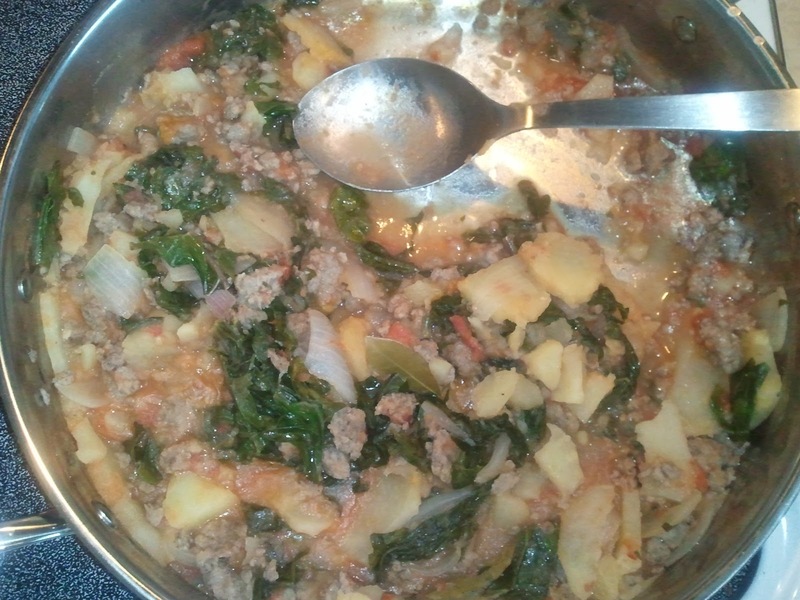 Mix everything together, cover, and let simmer until the potatoes are tender.